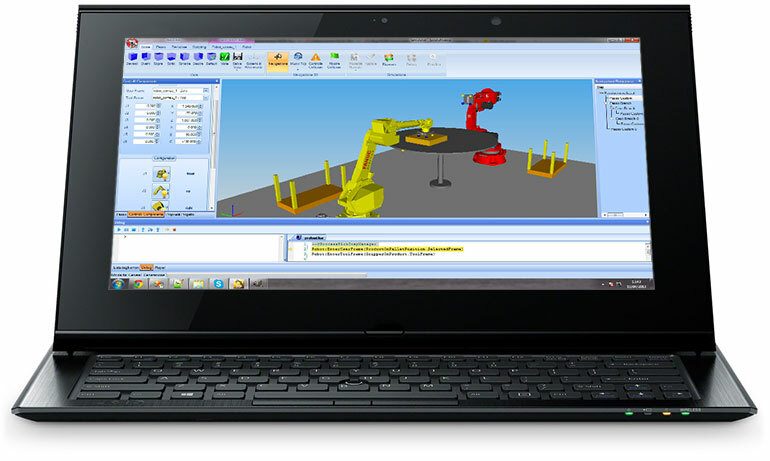 is the framework for the off-line programming and 3D simulation of robotic work cells and ulti-axis machines. Starting from the high-level description of the process, lrWorkCellSimulator builds the virtual environment and simulate the behavior of the machines (e.g. bending machines, cartesian robots, CNC machines…) involved. lrWorkCellSimulator uses the most advanced artificial intelligence algorithms to automatically ensure no collisions and maximum efficiency paths. The simulation results are then translated in the controller program, supporting the most common robot and CN manufacturers, to be uploaded on robots and machines. The rWorkCellSimulator framework has a modular architecture that adapts to the simulation of any type of industrial process. Its flexibility is extended by the scripting system that allows the customization of the process without requiring any special programming skills. rWorkCellSimulator uses the most advanced artificial intelligence algorithms to autonomously define the production process, controlling one or more manipulator robots and the machinery in the work cell.